Imagine receiving a Grammy Award nomination for a class project. For the musicians of the University of North Texas Jazz Studies Division’s One O’Clock Lab Band, it is a reality, not a fantasy. Of course, their latest Grammy nominated CD, Lab 20009, is more than a mere classroom assignment. It is a fully realized musical statement from one of the best known student ensembles in the country. North Texas might sound like dry country for jazz, but hip listeners know the Denton-based school was the first American institution of higher learning to offer a degree in jazz studies. While UNT Jazz has several highly regarded touring ensembles, auditions for the One O’Clock Lab Band are generally considered the most competitive. So named for its meeting time, the One O’Clock has been regularly recording professionally produced albums every year since 1967, racking up four Grammy nods prior to Lab 2009. This year, the One O’Clock is in contention for Best Large Jazz Ensemble and their director, trombonist Steve Wiest (previously a Best Instrumental Arrangement nominee), also returns to the Grammy ballot with a Best Instrumental Composition nomination. The One O’Clock starts cooking right from the get-go with “Sno’ Peas,” a Phil Markowitz composition best known from a rendition on Affinity, pianist Bill Evans collaboration with harmonica great Toots Thielemans. The UNT band nicely maintains the lilting swing of the original, suavely blending cool and hot, starting with Ben Haugland’s Evans-inspired solo, then segueing into some tenor heat from Sylvester Onyejiaka and some remarkably articulate trombone phrases from Luke Brimhall (which surely made his band director proud). Though the Grammy winners will not be revealed until January 31st, Lab 2009 already boasts one award with Kevin Swaim’s arrangement of Neil Hefti’s “Li’l Darlin,’” the co-winner of Downbeat magazine’s 2009 Student Award for Best Instrumental Arrangement, which dramatically showcases the eloquent alto of Sam Reid. Though Wiest’s roots are in the Maynard Ferguson band and historically UNT’s strongest institutional ties were to the Stan Kenton Orchestra, the One O’Clock sounds right at home in Count Basie-Neil Hefti territory. Dave Richards’s inventive arrangement of Dave Brubeck’s “Here Comes McBride” takes on a cool, bluesy sound from Chris Mike’s baritone saxophone and Ryan Hagler’s bass. A serious groover that won over the composer when he visited Denton, it is a real highlight of Lab 2009 (and check out that sly “Here Comes the Bride” quote as a fitting conclusion). When he has free time, which between his work with the One O’Clock and his own project s as a leader is just about never these days, Wiest has been known to enjoy classic science fiction and fantasy. Inspired by Kurt Vonnegut’s Cat’s Cradle, his Grammy nominated “Ice-Nine” is a pyrotechnic set closer that features powerful solos from Onyejiaka and Birmhall in a dynamic jazz-rock context. One of the joys of the late lamented International Association of Jazz Educators annual conference was the opportunity it offered to hear student ensembles like the One O’Clock Lab Band performing live. It gave one hope for jazz to hear the promise of the next generation of musical talent. Sadly, IAJE’s leadership ran the organization into the ground, but ensembles like the One O’Clock are still going strong. In a way, listening to emerging talent on Lab 2009 is a good approximation of the IAJE experience, as the remarkable level of the band’s musicianship definitely portends good things for the future. 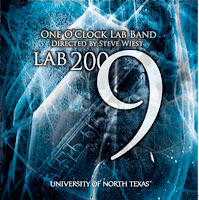 Warmly recommended (especially to Grammy voters) Lab 2009 is available for sale direct from UNT.